Google's Mobile Interstitials Penalty - What Should You Know About It? This policy is related to mobile searches only. If you have a desktop only website, you can use interstitials. But please note, your desktop site would be your mobile site in this case and hence you can expect suboptimal rankings. This policy only impacts search result to page. This means, Google will only check if a mobile interstitial is served after the searcher goes from Google search result to your page. What you do after that page is something Google will not look into. This also means, if a visitor arrives to your page from a traffic source that is not Google, you can serve popups or interstitial. Google has no issue with popups that are mandatory to be served, example - cookie consent notice or a popup that needs to be served to check the visitors age, probably on an alcohol site. If you are using a popup that is served after some time (once the user spends some time on the page), that can impact your rankings. This policy applies to page level. If your site serves interstitials on some pages that are visited from Google search results, that won't impact the overall website. That could downrank those particular pages where you serve intrusive popups. This was confirmed by Google's Gary Illyes on Twitter. Sites can use exit interstitials. These are interstitials that are served when a site visitor tries to leave the website. This policy has nothing to do with the current Mobile Friendly Test. 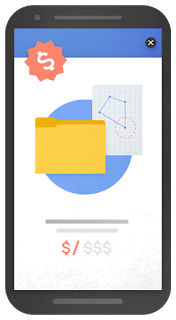 Google has no plans of creating a mobile interstitials testing tool. Even if your site passes Google's mobile friendly test, you still need to take care of intrusive interstitials on your pages. This policy doesn't apply to small popups that don't cover the whole page and prevent users from viewing the content. But we aren't sure what size is small enough. So better avoid using such popups unless and until they are very important. Mobile interstitial isn't the only ranking factor in Google's search algorithm. So if you see a site using mobile interstitial and still ranking well in search results, that could be because they are faring well in other ranking signals. Last but not the least, this is not a penalty. Google will just devalue pages from ranking well in search results that make use of intrusive interstitials. Since it is one of the ranking signals amongst huge others,It will be interesting to understand/see how the google algorithm will differentiate between a Cookie Consent pop up - other interstitial ad, small pop up - large that covers the page and mandatory pop up to check visitors age, example on alcohol site. Yes that would be worth checking. Additionally let's see how it affects brand sites where they might still continue using interstitial but yet rank well due to other ranking signals.